19/3-11 Malmö Int show Oggy Exc, CK & BOB-veteran!! 21 pwd´s entered. 18/3-11 The Dynamite-litter ( Biley´s Ja E´Dynamitharry X Cadamostos Cinderella) 2 years today!! Happy birthday to you all & have a wonderful day!! 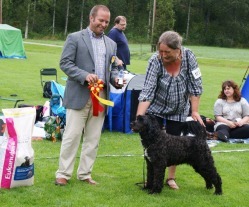 18/12-10 Stockholms Hundmässa-10 Inca got a 1st in intermediate-class,Cindi a 1st price &res. in openclass. 47 PWD´s entered judge Jorge Nallem Uruguay. 15/12-10 Happy news! Inca, Gentested Normal/Clear for PRCD-pra !!! 9/12-10 Happy 3rd Birthday to all "puppies" from the Music´n Dance-litter!! 27/11-10 Oggy entered in veteranclass for the 1st time(Open show,judge A-C Sultan). BOB,Group2,BOB-veteran, & BIS1-veteran!! 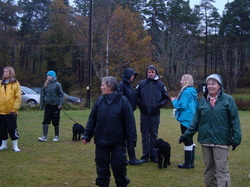 Thanks to all of you,who came & made the puppyreunion a fantastic day!!!! Lets do it again .....spring 2011!! It was really wet & cold ,but we had a great day!! CH. Steamwater´s Monkey Marin "Oggy" BOB (freeclip-class) & BIS2 at the Swedish national specialty 15/8-10!!! Nearly 8 years "old" Oggy went BIS2 at the nat. specialty!! I´m so proud of my beautiful boy!! Inca (Madlands Dynamite Mad-Inca) 1st in intermediate-class & res.best female & Nessie 3rd in open-class (ownerhandled, way to go Claes!! you did a great job!! )We had a fantastic day in Askersund with lots of beautiful PWD´s,nice people & nice weather.....what more canone ask for?? Proud parents are my oldest son Robin & his wife Ida! Big congratulations to you both! Welcome to the world SOFIA!! 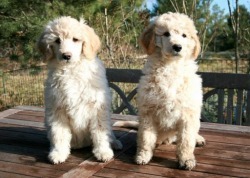 11/6-10 At last, Cindi & Nick´s puppies are here!! Both mum & babies doing great!! 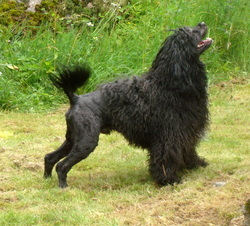 All black puppies with small white markings. 4/6-10 Great news!! 7 of Cindis pups from the litter with "Harry" are now hipscored & we´re pleased to announce that we got 3 FCI A,3FCI B &1 FCI C !!! This is fantastic, this means that,at their next show 2 of Cindi´s daughters are up for their swedish CH-title!! & a couple of their siblings has alredy got their 1st CAC´s !! Thanks to You all, you´re great! !